We were on vacation for a week, just relaxing and having a good time, and away from computers most of the time! We went to the southern part of the state to a rental cabin. It was deep in the Shawnee National Forest. This was one of the cabins we had visited before and really enjoyed. 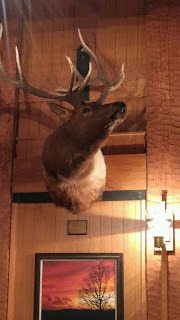 One night we went to Giant City State Park Lodge for dinner. It was a bit of a drive from the cabin but the meal was well worth it. The decor was pretty cool too. This guy watched us eat.